IELTS is one of the most important requirements to go abroad either for study or work. IELTS is basically ‘International English Language Testing System,’ which ensures that you understand the language. Most of the English speaking country requires this test before you enter their country. How to prepare for IELTS? Keep reading, you will find the answer. Since English is not the first or mother language in Pakistan, you need to learn it to pass the IELTS test. There are hundreds of IELTS training centers all over the Pakistan, but only, few of them are really capable of producing great results. When it comes to IELTS Classes In Lahore, it’s very hard to find a reliable coaching center since most of them have no experience of IELTS. IELTS preparation is not about learning the English language only, neither it’s only about learning the pattern of the test, you need to address both at once. Most of IELTS teachers in Lahore are focusing on the format, but not helping the students with improvement in English. For getting GOOD BANDS in IELTS, you need to improve your basic English before anything else. It’s a very wrong belief that you can’t improve the English language in a short span of time. With right directions and proper guidance, you can improve your English in no time. 1 How to Prepare For IELTS? How to Get 7 Band in IELTS? 2 How to Practice the IELTS Test? How to Prepare For IELTS? How to Get 7 Band in IELTS? Let’s come to the point and learn how to get the desired IELTS band with minimum effort. Start with the official IELTS practice material. Try to understand the pattern of IELTS test and then consider your weak points. The last and most important step is to practice the test again and again. Remember, there is a maximum time for each module. Practice until you can complete the test within the given time. Note: This information is regarding how to prepare for IELTS, not how to improve your basic English language. If you have appeared in the IELTS test and not able to score the desired band, you might need to focus on your language. Get the admission at Immigration Experts IELTS Classes In Lahore and you will be able to get the desired band for sure. How to Practice the IELTS Test? Practice Makes the Man Perfect! Practice is very important in almost every field of the universe. It’s hard to achieve your IELTS goal without practicing it perfectly. Listening is the easiest module of the IELTS test. The test includes 40 questions and you need to answer them while hearing from the speaker. The best way to practice is to start watching the movies without subtitles, listen BBC English news for half an hour daily, and etc. After practicing this for a couple of weeks, you can download the sample tests available online and test your listening abilities. Keep practicing until you start making your desired scores. Reading is a bit tricky! In my personal opinion, this is the most difficult module of the test. But, practice can make you get the desired score. First of all, you need to understand the nature of reading module. In the reading test, you need to read the given stories and answer the questions. Time is the key in this module. Most of the people claim that they left some questions because the time ran out. Actually, you don’t need to read all the paragraphs and then answer the questions. Skimming is the way to go! For practicing, you need to download plenty of reading tests and start completing them. Start the timer once you start a test and try to complete it as soon as possible. In the start, you can take extra time for each test and then you can start reducing the time. For further details and guidance, it is recommended to contact us and admit yourself in the classes at Lahore. We also offer a 3-Day special training for IELTS. Let us know if you are interested! Writing! It’s all about practice and your writing abilities. How to improve writing ability? Writing can be improved through reading other writers and then trying the same. If you think that you can improve it, you should take admission in IELTS classes. Download the official test materials and you will get an idea about the topics. Now, your job is to research these topics and try to write as better as possible. Write for an hour each day and you will get better in a month for sure. If you have appeared in the test and didn’t received the target score, you can contact us any time and we will guide you how to get the desired BAND. Speaking is all about confidence and your ability. There are a number of people who can speak english perfectly, but they get confused in front of the invigilator. With the ability of speaking, you also need to improve your confidence level, so you can speak at the right moment. For practicing, you can get to someone who can speak English and talk for at least 30 minutes each day. For better results, you should join IELTS academy where everyone is speaking English. In a complete English speaking environment, you will improve your speaking skills in no time. Immigration Experts are proud to announce that we have started classes of IELTS in Lahore. In this IELTS course, you will be guided by the most experienced English teachers. Discounted Rates are available for initial students! 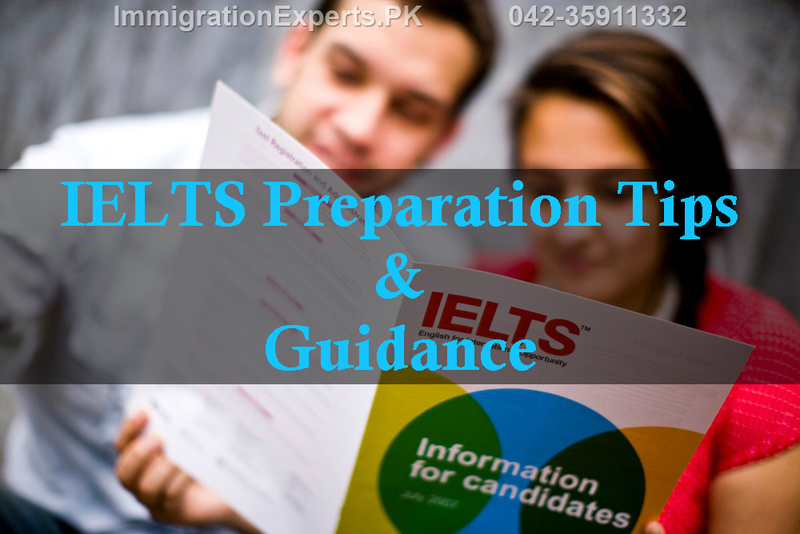 Although, I have explained the path to success, but if you want to be very sure that you get the desired IELTS band, you are advised to admit yourself at Immigration Experts organized IELTS classes in Lahore. We will guide you briefly regarding how to practice the test in a better manner, how to understand the pattern of the test, and how to complete the modules in the provided time. Immigration Experts have created the perfect practice materials that enhance your overall language skills, resulting in good IELTS results. Get yourself admitted in IELTS Classes in Lahore and get 7 Bands easily! Note: IELTS Classes by Immigration Experts are currently available in Lahore only.